Seizure is defined as ‘a sudden surge of electrical activity in the brain, which usually affects how a person appears or acts for a short time’. Children who have experienced seizures commonly present to emergency departments (EDs), and detailed history taking will usually help differentiate between epileptic and non-epileptic events. ED nurses are often the first health professionals to manage children with seizures, and this is best done by following the ABCDE approach. Treatment involves termination of seizures with anticonvulsants, and children may need other symptomatic management. Seizures in children can be an extremely distressing experience for parents, who should be supported and kept informed by experienced ED nurses. 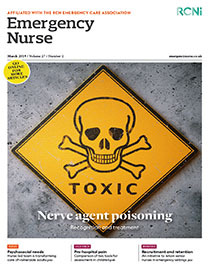 Nurses also play a vital role in educating parents on correct administration of anticonvulsants and safety advice. This article discusses the aetiology, clinical presentation, diagnosis and management of children with seizures, with particular emphasis on epilepsy. It includes two reflective case studies to highlight the challenges faced by healthcare professionals managing children who present with convulsions.